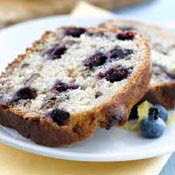 The tartness of lemons complements the sweet subtle taste of walnuts in this quick bread recipe. The addition of blueberries offers a colorful antioxidant boost. 2. In dry skillet, toast walnuts over medium-high heat for 1 to 2 minutes. 3. In large bowl, combine all-purpose flour, baking powder, baking soda and salt. Whisk to combine. 4. In medium bowl, combine sugar, lemon zest, buttermilk, eggs, vanilla, melted butter and oil. Whisk just to combine. 5. Make a well in center of dry ingredients. Add liquid ingredients and mix gently just to combine; do not over-mix. Gently fold in walnuts and blueberries. 6. Pour batter into a greased and floured 8 x 4-inch loaf pan. Bake in preheated oven for 55 to 60 minutes or until tester inserted in center comes out clean. Cool on rack for 20 minutes; remove from pan, cool to room temperature. 7. To make the glaze, combine sugar and lemon juice in small saucepan. Bring to boil over high heat, then reduce heat and continue stirring until sugar dissolves. 8. Brush glaze over bread while still warm. Leftover buttermilk can be frozen for future use. If using frozen blueberries, do not thaw before adding to the recipe.